Hiker Chiu is the founder of Oii-Chinese since 2008. 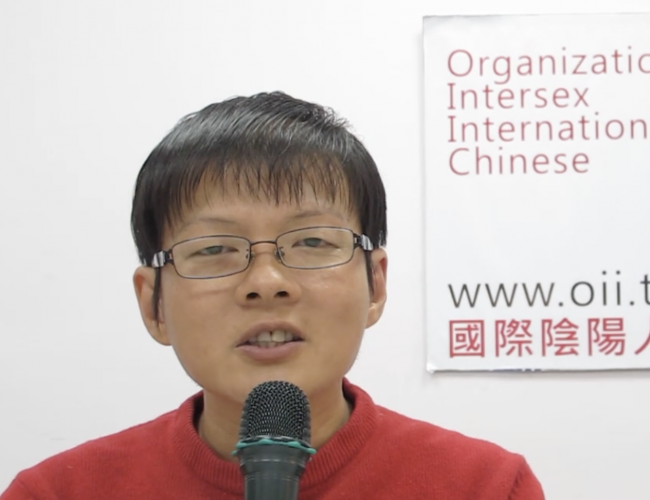 Oii-Chinese is a platform for Chinese-speaking intersex people to get information, awareness, connection and peer support, and an intersex human rights advocacy organization. Hiker Chiu was the first person to come out as intersex in Taiwan, initiating the "Global Free Hugs with Intersex Movement" in the 8th Taipei Pride Parade 2010. The only Asian delegate in the first and second World Intersex Forums held by ILGA, Hiker is devoted to work building intersex connections in Asia. Hiker is a PhD. candidate of the Graduate school of Human Sexuality Shu-Te University in Taiwan.